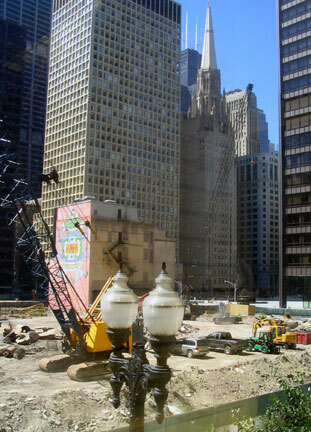 Since just after the Great Fire of 1871, Chicago has been a franchise player in global architecture. You can’t walk more than a few blocks around the Loop or North Michigan Avenue without stumbling on some remarkable structure that could happen to be one of the world’s most renowned buildings. But there’s a lesser-known treasure trove, more dispersed but no less rich, and that’s on college campuses, which seem to breed like rabbits here. Dozens have left their mark on the built landscape. In the 1890s, John D. Rockefeller and Marshall Field got together to create the University of Chicago on swampland in the south-side neighborhood of Hyde Park. A decade later, Loyola began building on 20 lakefront acres in the northernmost neighborhood of Rogers Park. In the 1930s, the Illinois Institute of Technology lured architect Ludwig Mies van der Rohe from Germany to create a new campus in the south-side community known as Bronzeville. In the 1960s, the University of Illinois bulldozed most of Little Italy on the near west side and moved its Chicago outpost there from Navy Pier. Some of the schools’ buildings are deservedly famous: There’s Walter Netsch’s classic—and controversial—brutalist structures at UIC. At IIT, Mies’s gloriously restored 1956 masterpiece, Crown Hall, has recently been joined by two new megastars, Helmut Jahn’s State Street Village, as sleek as a streamlined 1920s passenger rail car, and Rem Koolhaas’s riotous McCormick Tribune Campus Center, with its angled roof, orange glass, and stainless steel, rigatoni-shaped tube muffling the roar of the CTA trains as they speed through the campus. 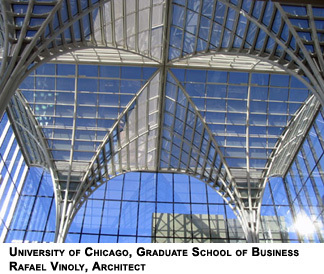 At the University of Chicago, Frank Lloyd Wright’s Robie House has a new neighbor, Rafael Vinoly’s stunning cubist Graduate School of Business, with its lofty, light-filled Winter Garden. Nearby is another recent addition, Cesar Pelli’s brawny, tall-masted Ratner Athletic Center. But there are plenty of less-well-known university buildings that are also worth a look. 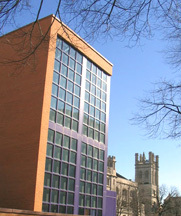 At IIT, a school overrun with architectural landmarks, it’s easy to miss the Robert F. Carr Memorial Chapel (65 E. 32nd St.). 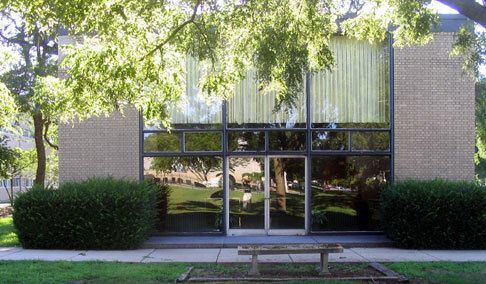 Completed in 1952, it’s the only church building designed by the great Mies van der Rohe. It’s made of load-bearing bricks, not Mies’s usual steel, and unique among Mies’s campus buildings, it has an exposed ceiling rather than dropped tile. 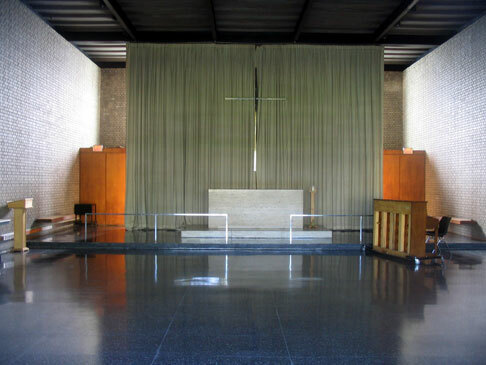 Known on campus as the “God box,” the chapel has an austere, monastic elegance. The interior consists of but one room, with steelframed glass on the walls facing east and west. An astringently simple stainless steel cross hangs above an altar cut from a single block of travertine marble, in front of a floor-to-ceiling curtain. The space is as unadorned as a storage shed. No icons, no paintings, no Gothic ornament, no Bible stories evoked in colorful stained glass. Just you and your maker. 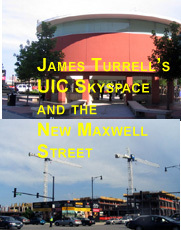 When the Max Palevsky Residential Commons (1101 E. 56th St.) opened in 2002 at the University of Chicago the dorms were slammed by the Chicago Tribune’s architecture critic, Blair Kamin, as too big and too garish: “It just doesn’t come off,” he ruled. True, the complex is two full city blocks long. And yes the steel frames of the glass entrance bays are painted Day-Glo yellow, pink, or purple, to which I can only say, " thank God!" What a welcome relief from the medieval gloom of the relentlessly Gothic old campus. 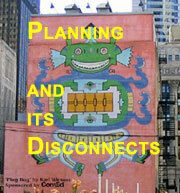 The best part of the design, by Mexican architect Ricardo Legorreta, is the light-colored brick used in the facades. The gray stone of the old campus buildings has a way of sucking up the light, spreading a cold, damp pall on even the brightest winter day. Legorreta’s brick, on the other hand, seems to capture and amplify the sunlight, reflecting an optimistic warmth that dissipates the grayness of the structures around it. In summer and fall, it seems almost to conspire with the leafy starbursts of the nearby ginkgo trees to subvert the surrounding pomposity. 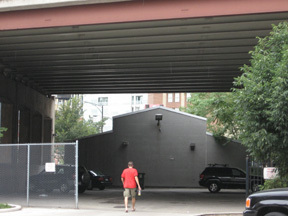 At 625 N. Kingsbury, in the grungy shadow of the Ohio Street ramp off the Kennedy Expressway, a plain gray bunker of a building may look like a storage shed but its quirks give it away: the Chiclet-white cornices, the 34 clerestory windows just below the roofline, the way the wall takes a geometric twist to form a canopy over the orange entrance door. Step inside, and you find yourself in an inviting, generous and graceful open studio. 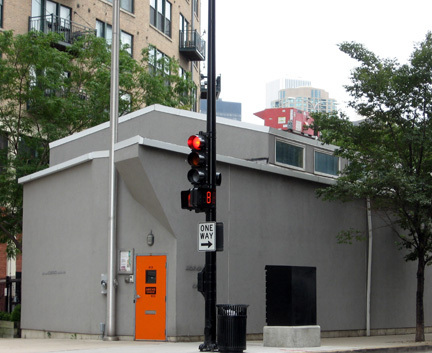 This is the home architects Stanley Tigerman and Eva Maddox made for Archeworks, the alternative design school they founded in 1993. 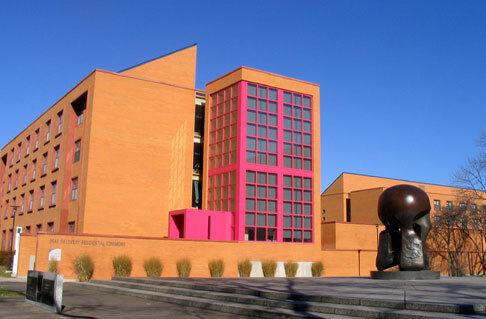 The building reflects the school’s unique emphasis on the ethical aspects of design. This year’s projects include the “greening” of the Museum of Science and Industry, better ways to get information on disaster preparedness to the public, and products for stroke survivors. When Archeworks was built in 1997, its no-nonsense design fit right in with the parking lots, broken glass, and rubble-strewn wastelands that defined the area. Now that the neighborhood has evolved into a sleek enclave of residential highrises, the building has become a bracing counterpoint of simplicity, elegance, and purpose. While some schools have wiped out whole neighborhoods to set up shop, others have taken a different route: Roosevelt University made Dankmar Adler and Louis Sullivan’s Auditorium Building its home in 1947 and DePaul took over the former Goldblatt’s department store on State Street. The downtown Loop has evolved into a major education center, with a population of over 50,000 students. 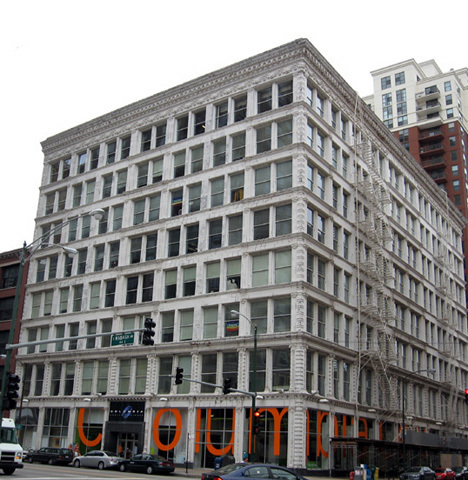 Columbia College, however, can be said to have saved an entire neighborhood, becoming the hermit crab of the South Loop. Beginning with the 1976 purchase of 600 S. Michigan, a 16-story skyscraper built for the International Harvester Company in 1907, Columbia has expanded by snapping up a growing array of vintage buildings. 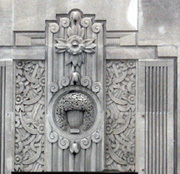 Today, its nearly 12,000 students are spread across 16 structures with over a million square feet of space, including the Dance Center of Columbia College (1306 S. Michigan), a 1930 art deco edifice built for the Paramount Publix Corporation when the area served as home to the local offices of all the major movie studios. Pride of place in Columbia’s collection, however, has to go to William LeBaron Jenney’s 1890 Ludington Building (1104 S. Wabash), one of the first steel-framed structures and one of the first to cover that frame entirely in terra-cotta. Add in the nearly floor-to-ceiling windows, and the result was a light, open structure, an early precursor of what Mies later defined as an architecture of “almost nothing.” Chicago architect's Ross Barney + Jankowski have just renovated the wide open, 11,000 square foot Conaway Student Center on the ground floor in white, cool blues and lime green. and the way the supersized orange letters of the Columbia decal wrap around the huge windows of the building’s northeast corner seamlessly integrates a hip 21st-century aesthetic with Jenney’s original 19th-century classic cool. 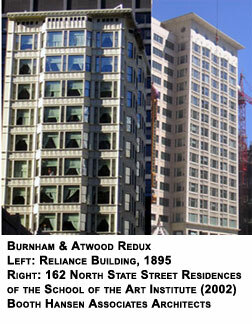 The high-rise dorm at 162 N.State designed by Booth Hansen Associates for the School of the Art Institute in 2000 qualifies for “hidden gem” status not because of its quality—its main distinction is the way it mimics the landmark Reliance Building (32 N. State) a block to the south. No, this building makes the list for its location at the northwest corner of State and Randolph, which gives the design students lucky enough to score a view a supplemental education watching construction proceed on Block 37, the site across from the Marshall Field’s - so sorry - Macy's store that has stubbornly resisted repeated efforts at development since all of its buildings but one were hastily demolished in 1989. Plans call for a block-long mall on State, a skyscraper at Washington and State with street-side studios for CBS Two Chicago at its base, and two new residential towers along Randolph. After a long churn of developers and several false starts, this could be the project that actually succeeds. For those of us without one of those south-facing dorm rooms, a slightly less lofty version of the same view can be had from the second-story windows of the Borders at its base.